Pre-order today for a March 6 delivery! 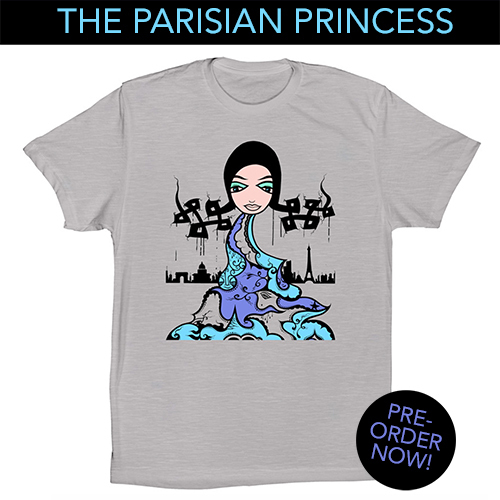 The Parisian Princess: T-Shirt Edition! Thank you so much for checking out this new shirt design! I'm super stoked to get "The Parisian Princess" printed on some shirts and I hope you are too. This pre-order deal is sort of a like a Kickstarter campaign. If our goal is met then the shirts go into production and will ship out as soon as possible. We need to meet our goal by Feb. 12, 2017 to make that happen. Once the deadline hits and these go into production you can expect your Parisian Princess shirt to arrive in your mailbox by March 6. Here a few details you might want to know. It's been about 3 years since I've released a shirt graphic, so I'm very excited about this and I appreciate all of your support! There is some more info on that site, but if you have any questions please don't hesitate to ask.